My R34 GT-T "pops" backfires mainly when cold if i accelerate hard then it happens as i decel. So i try to ease her in until she's warm. Doesn't happen when warm. Anyone had their stock R34 GT-T turbo reconditioned? Hi flowed, steel wheels bearings etc? yeah i was think of that one too. i guess you wonder how much power diff there would be though. also a big $$ diff. Update - new battery fixed issue The old battery was original you would think it was a good idea to replace the old battery with a new one at compliance. Oh well, I glad it wasn't a major component. Hi All, I have a very intermittent (only happened twice) problem. About 6 weeks ago my R34 GT-T wouldn't start. It turned over but no ignition. The symptom was like I had no fuel (there was plenty). After continuously turning it over the battery went flat. I went down the local servo and got a battery from there and hooked it up and after turning it over and much spluttering it started. I hasn't missed a beat until today (hasn't been started since Friday). It didn't start straight away. I heard a few clicks from the engine and it turned over more than usual then ignition. I went for a drive without incident. It will no doubt start straight away in the morning. Usually it starts first pop after hardly turning the key. help and advice much appreciated. Update - as predicted, it did start first pop this morning and again at lunch time. Shrug!! Update - Car wouldn't start yesterday morning. Just lots of ticking when i turned the key. Called auto electrician and they said "the battery is flat" Called RACT and confirmed flat battery. When down local servo and bought a new one. It's called a Boot lock retaining clip. I bought one from Nissan parts for $6 - It's the same one in the S15 Silvia. Open boot, take panel off and clips in place holding lock cylinder firm. Great, thanks. also found this site. 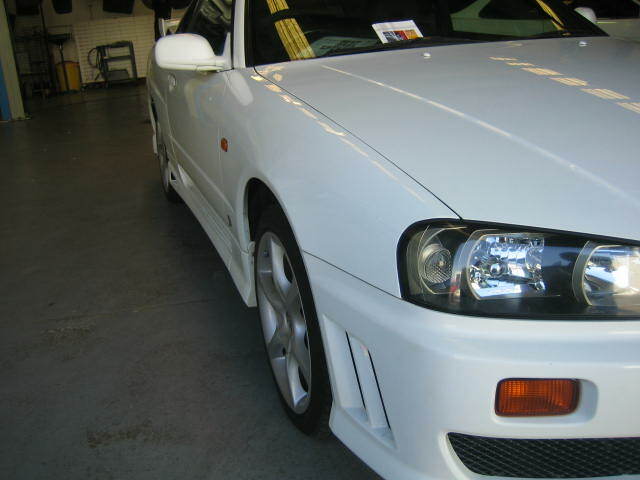 http://www.r34gtt.net/r34start.html Technical Help Owners "how-too's"